Sophomore Andrea Mitrovic was dominant this weekend as the Bulls picked up a pair of road victories. On Sunday, Mitrovic set a new school record for kills in a match as she had 34 kills in the 3-2 win at Kent State. The 34 kills broke a 23-year old school record set back in 1995. She also added 16 digs and four blocks in the victory over the Golden Flashes. 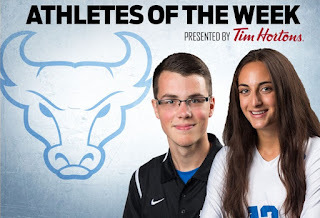 It was the second time in as many matches that Mitrovic had set a career high for kills as she had 25 in Buffalo’s 3-2 win at Ohio on Friday night, which was UB’s first ever win at the Convocation Center. For the weekend, Mitrovic averaged 5.9 kills per set and 6.55 points per set. For the year, she is averaging just over 4.3 kills per set. Caleb Covell led the Bulls at the Paul Short Invite with a 24th place finish overall in a deep, competitive field of 360 runners, crossing the line with a time of 24:53 and helping the Bulls to a 13th place team finish of the 40 teams in the Men’s Gold Invitational race. This is Caleb’s 3rd race in a row leading the Bulls.